Sara and I spend many hours working with strips of birch bark. We harvest the freshest pages, as we call them, from a few fallen birch trees around our yard. Vermont is home to many birch tree varieties, and our yard is no stranger to nature’s occasional offerings and donations. The material poses challenges for the inflexible. It is resilient and water proof, but it can break easily, too. Parts of it continue to peel worse than a fragile onion—only in the most paradoxically durable way. The material is fashionably lied about everywhere in popular culture for being white, charmingly mottled with deep brown or grey. Most bark paper is ruddy, reddish brown, nearly pine, with smooth random marks like Morse code or that notched paper fed into old self-playing pianos. It comes in distinct colors and textures, which is good news to those with a design mind. With an ability to create sharp contours and contrasts, birch possesses rich potential as an expressive art form. To purchase our birch craft products, please click here. We have spent luscious autumnal mornings and late summer evenings making flowers out of clay. We are doing this in preparation for another Almanac, this one to be made entirely of flowers in clay. We will call it the Floramanac. Through tiles of clay flowers and collaborative practice, we recognize the passing of the seasons together. This vertical series features our rendition of the flowers still spreading the joy of their colors in our garden: the lily, daisy, home run rose, and oversized petunia. The daylily, as lovely as she is hardy and resilient. We have birch trees that cozy up to our cottage, peppering the yard with occasional branches. What to do with these offerings? Here are ten great ideas for the birch enthusiast. You could begin with an old float toy from the pool and a good pair of scissors. Cut the bark into regular strips, then glue them to the toy. We like to use wood glue diluted with water for such applications. Voila! If you have need for a special touch, let birch bark help you say how you feel. 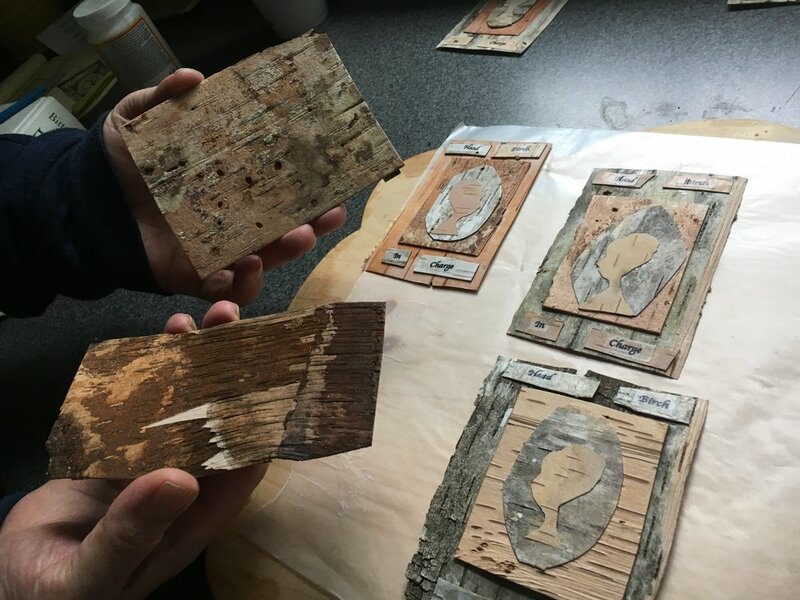 We are birch bark aficionados and even we were surprised at how gorgeously these materials come together. We figured out a way to tape thin strips of bark onto paper, fooling our printer into printing onto the bark. Here is a detail of two panels from Almanac #2 (December). Side-by-side, the unadorned beauty of the wood grain contrasts against the mechanical gloss of the ink and varnish. Thanks to their durability, birch strips easily lend themselves to various applications. They work great as covers. Here is our version of a personal notebook with flair. Strips of birch add softness and design appeal to this makeshift seed caddy. We made it from scrap wood left over from our projects. A word here, a snip there, and any natural element like a birch curl can add drama to your environment. The trick is in placing it just right. Sometimes, we need just one stem to go in the middle of an arrangement. For such moments of floral precision, try the waterproof spring of a birch curl. It can fit into most flumes to create a dedicated track for that special stem in your bouquet. We use backyard sticks in lots of projects. Birch makes for a sturdy frame. Don't even get us started on using denim to paint on! This spinner comes from our Almanac #4. You spin to get what should seem like many results, only in our cheeky universe of spinners, there are only two options. The durability and flexibility of the birch bark made this project a breeze. You might use the bark to make your own gadget for that special spinner in your life. Bored backseat passengers on long rides might find the possibilities pleasantly distracting. We fashioned this piece of birch to represent a mailbox. Inside the curl rests a letter, bound like a scroll and ready for delivery. Because the material is very responsive to glues of all kinds (white glue, wood glue), we know there are many ways to build a box with birch. The strips could be used as panels or just the curls. The possibilities are endless. 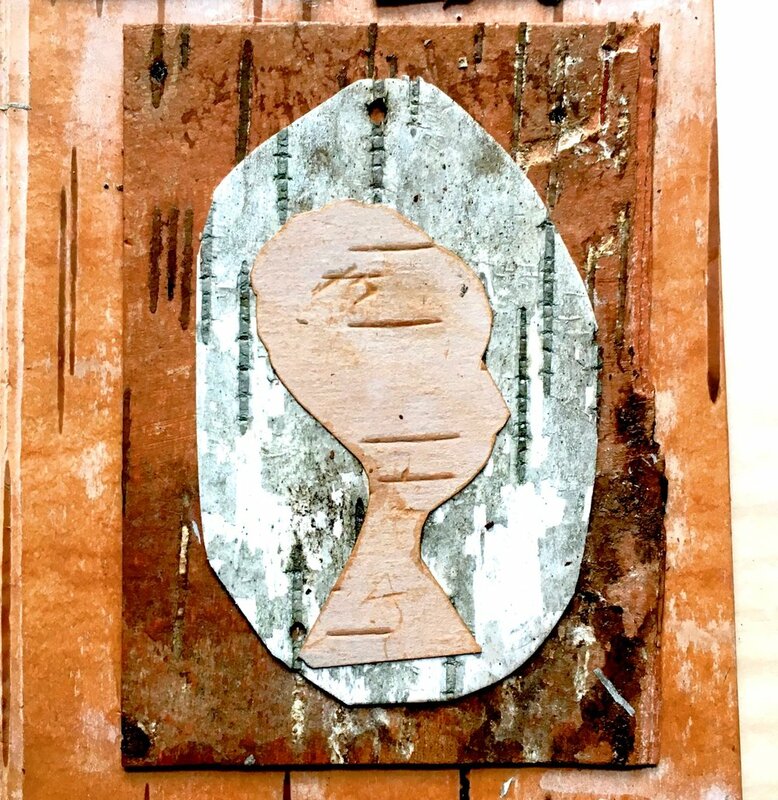 Count on us to experiment more with birch bark in our mixed media Almanac artworks. 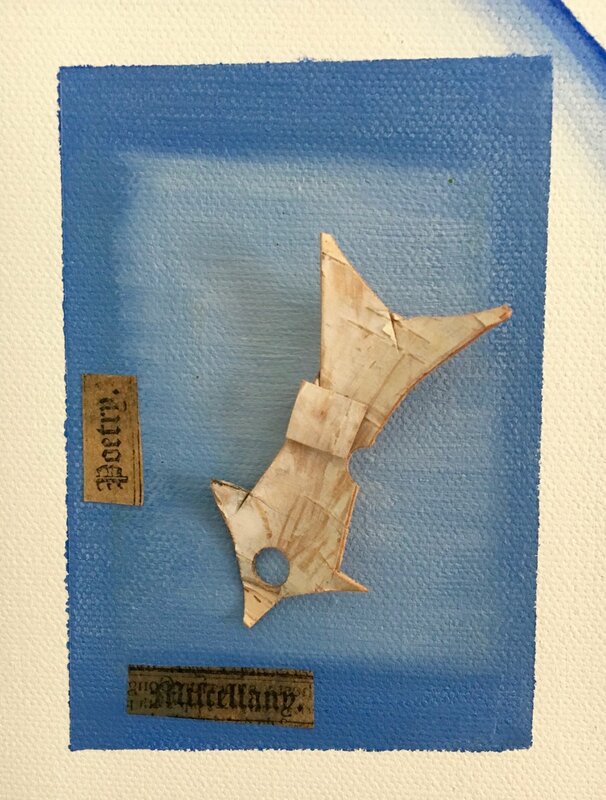 Also, please check out our latest birch crafts here. Our latest birch craft designs showcase the rustic grain of the birch (as well as a few sprigs of dried leaves), converting the paper into a lovely and durable ornament you can hang on a window or a wall. 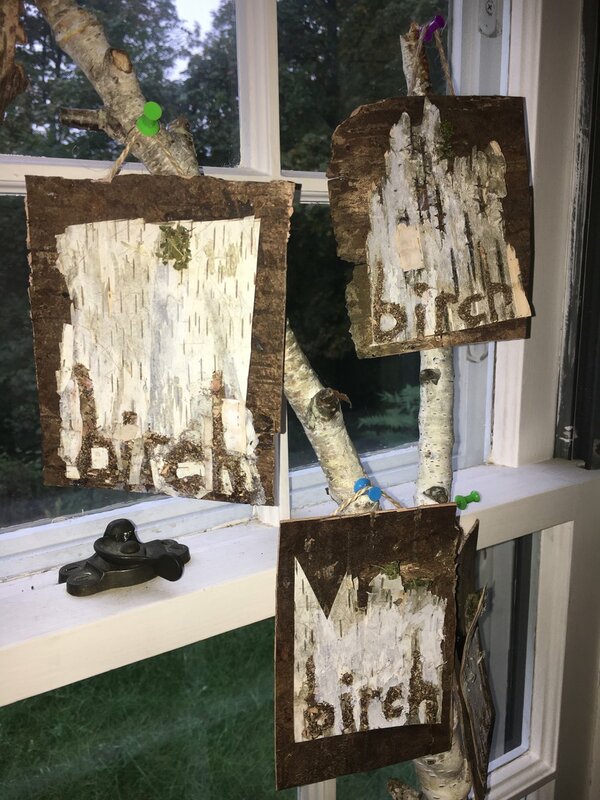 See our birch crafts here.